Maria's Space: Mark Your Calendar: Thunderbirds Are Go Season 3 skyrockets onto Prime Video on Friday, April 21! Mark Your Calendar: Thunderbirds Are Go Season 3 skyrockets onto Prime Video on Friday, April 21! 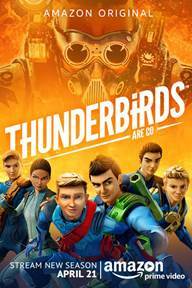 Seasons one and two of Thunderbirds Are Go are available for Prime members to stream and enjoy using the Amazon Prime Video app for compatible TVs, connected devices, including Amazon Fire TV and mobile devices, or online at www.amazon.com/kidsoriginals, at no additional cost to their membership. Prime members can also download select titles to mobile devices for offline viewing. Eligible customers who are not already Prime members can sign up for a free trial at www.amazon.com/prime. For a list of all Amazon Video compatible devices, visit www.amazon.com/howtostream. Thunderbirds Are Go is also available as part of Amazon FreeTime Unlimited, the all-you-can-eat subscription service designed from the ground up for kids. FreeTime Unlimited is available exclusively on Amazon devices, including Amazon Fire TV and Fire tablets, and a year-long subscription is included with every Fire Kids Edition.